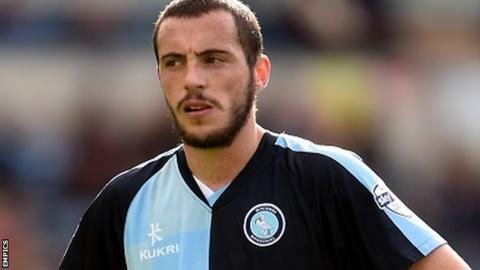 Wycombe went top of League Two as Michael Harriman scored the only goal against 10-man Cambridge United. Goalkeeper Chris Dunn was sent off when he fouled Gozie Ugwu in the box but substitute Sam Beasant saved Garry Thompson's resulting penalty. Marcus Bean then hit the bar twice in a minute as the hosts' dominance continued before Harriman finally netted the winner with 20 minutes left. He struck a precise, right-foot shot into the far corner past Beasant. Match ends, Wycombe Wanderers 1, Cambridge United 0. Second Half ends, Wycombe Wanderers 1, Cambridge United 0. Luke O'Nien (Wycombe Wanderers) wins a free kick in the attacking half. Dangerous play by Liam Hughes (Cambridge United). Attempt missed. Gozie Ugwu (Wycombe Wanderers) right footed shot from long range on the right misses to the right. Substitution, Wycombe Wanderers. Daniel Rowe replaces Aaron Holloway. Attempt missed. Luke O'Nien (Wycombe Wanderers) right footed shot from outside the box is close, but misses to the right. Attempt missed. Matt Bloomfield (Wycombe Wanderers) right footed shot from outside the box is close, but misses to the left. Liam Hughes (Cambridge United) is shown the yellow card for a bad foul. Marcus Bean (Wycombe Wanderers) wins a free kick on the left wing. Corner, Wycombe Wanderers. Conceded by Harrison Dunk. Substitution, Wycombe Wanderers. Matt Bloomfield replaces Michael Harriman. Garry Thompson (Wycombe Wanderers) wins a free kick in the attacking half. Corner, Cambridge United. Conceded by Michael Harriman. Goal! Wycombe Wanderers 1, Cambridge United 0. Michael Harriman (Wycombe Wanderers) right footed shot from outside the box to the top left corner. Substitution, Cambridge United. Ryan Donaldson replaces Conor Newton. Substitution, Cambridge United. Greg Taylor replaces Elliot Omozusi. Corner, Cambridge United. Conceded by Marcus Bean. Marcus Bean (Wycombe Wanderers) hits the bar with a right footed shot from the centre of the box. Attempt saved. Marcus Bean (Wycombe Wanderers) header from the centre of the box is saved in the centre of the goal. Attempt missed. Luke O'Nien (Wycombe Wanderers) right footed shot from more than 35 yards is close, but misses the top left corner. Attempt missed. Marcus Bean (Wycombe Wanderers) right footed shot from outside the box is close, but misses the top right corner. Penalty saved! Garry Thompson (Wycombe Wanderers) fails to capitalise on this great opportunity, right footed shot saved in the centre of the goal. Substitution, Cambridge United. Sam Beasant replaces George Taft.